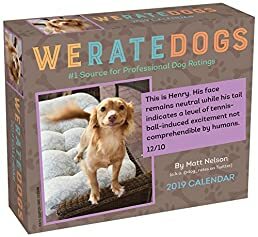 The WeRateDogs 2019 Day-to-Day Calendar showcases some of the world’s most heroic, over-the-top adorable, exceptionally spectacular doggos. It’s based on the paws-itively pup-ular Twitter feed where dogs always earn stellar ratings of at least eleven out of ten because all dogs are good dogs! Each page of this calendar includes an amazingly cute or funny photo, plus an entertaining caption—and the pupper’s fabulous rating.